When my new HP ProBook 4320s arrived last week, the installed Operating System was Windows XP which is not my original ordered specification. I called my supplier and told me to wait for the Windows 7 installer which will arrive a week after. I cannot wait so I installed a non-genuine copy of Windows 7 while waiting for the genuine version. After installing Windows 7, a non-genuine nag screen always appear so I started looking for a removal tool. 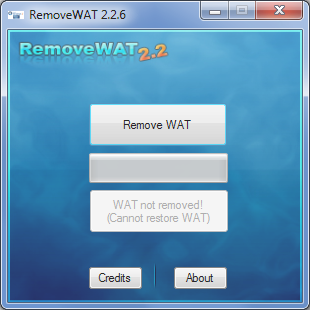 I found RemoveWAT , short for remove Windows Activation Technologies. Once installed, just click Remove WAT from its main interface. You will be asked to reboot you system to apply the changes.